The Nebelwerfer 41 was equipped with six barrels, each firing a 34 kg (75 lb.) 150 mm (5.9 in.) Wurfgranate 41 ("rocket shell 41") rocket out to a range of approximately 6800 meters (7437 yards). The later Nebelwerfer 42 had five 210 mm (8.3 in.) barrels and could fire its 114 kg (250 lb.) Wurfgranate 42 rockets out to a range of approximately 8000 meters (8749 yards). This variant was equipped with removable internal rails to allow the use of the 150 mm rocket. Both types were towed pieces which were mounted on the modified carriages of a light pre-war anti-tank gun. After the crew had loaded and aimed the launcher, they would take cover a few meters away and fire the rockets in succession with an electric switch. After firing, however, a long streak of smoke could be seen from far away, making the Nebelwerfer an excellent target for enemy counterbattery fire. It was therefore necessary to relocate the launcher and crew as soon as possible after firing. The concentrated impact and blast effects of the Nebelwerfer rockets were extremely effective (both physically and psychologically) against infantry and soft-skinned vehicles. However, tanks and other armored vehicles were relatively immune to its effects unless the rare direct hit was scored. 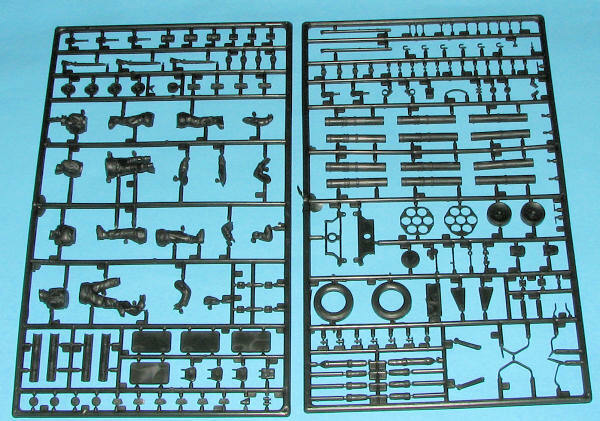 Though ESCI is more well known for its 1/72 military kits, it did produce several in 1/35 scale. At one time, Aurora was reboxing ESCI kits, but when that company went under in the late 1970s, then ESCI started selling under its own name or in concert with Scalecraft. This particular kit is molded on two sprues of very dark green. 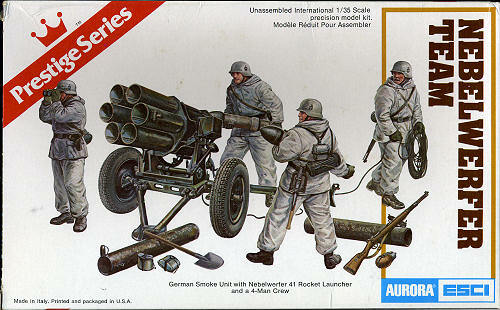 One contains the Nebelwerfer and the other the crew figures. The crew figures are well molded and for injected plastic, quite thick. However, I only found visible sink areas on the boots of one of the figures. All of the figure accessories are separate and will need to be glued in place. There are two loaders, a spotter and the man who fires the weapon. According to the box art, these men are in winter clothes. The only decals are for the helmets of these men. The nebelwerfer itself is on the other sprue. Each of the barrels is in two halves and half of the six step instruction sheet is concerned with its construction. From the look of things there are more pieces for this than one would initially think. Constructing the carriage takes up the rest of the construction steps and again, there are a lot of small pieces involved, making this a less than optimal kit for a tyro. There are also ejector pin marks on various bits that will need to be cleaned. It reminds me quite a bit of Italeri's 105mm howitzer in its complexity. Fortunately, the instructions are quite well done with detail shots to help in putting the pieces in the correct place. No color information is provided in the instructions, but there is some on the back of the box for the figures and one can use the box art for the launcher itself. It seems that panzer grey would be appropriate along with any winter wash you might care to apply. So there you have it. Not sure how available this kit is since it is 30 years old, but I found one and it was considerably less expensive than a similar one by Italeri that did not include the crew. It certainly won't take up a lot of shelf space and would be a relaxing build for those accustomed to 800 piece Dragon kits.